Does having a PhD change anything? I graduated with my PhD in December 2009, having studied for my doctorate concurrently with a full-time professional librarianship job. Once I’d got the PhD, I intended to continue my dual existence as librarian and independent researcher. This wasn’t what I’d have considered ideal, but in these difficult employment times, I couldn’t contemplate a career shift if it meant abandoning an established professional career, even if I’d have preferred to move more into academia. Things went according to plan. I wrote more articles and papers, with a view to a book submission a bit further along the line. As you’ve read in earlier blogposts, I did eventually submit my thesis for publication with Ashgate. It included an extra chapter, written to embrace the research that I did subsequent to the PhD. As I write this, I have a rather wonderful document in front of me – my book. 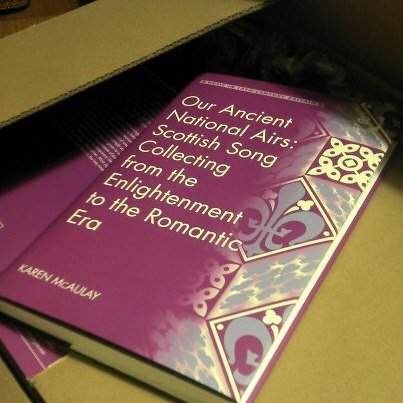 My copies have just arrived by post, in advance of their publication mid-March 2013. We’re having a launch in the Whittaker Library on 26th April, with talks from me and our Director of Academic Development, and music from some of our students and friends. I’ve also given occasional lectures at two of our local universities, and talks to some local interest groups. Having worked full-time as a librarian for nearly three decades, it’s interesting to find myself job-sharing for the first time. It’s working well; we’re getting used to the leaving “handover notes” for each other, not to mention tasks left half-done for someone else to complete, queries partially answered, and the catching up that occupies those first hours back on the job again. My research existence takes place outside the library – whether elsewhere in the Conservatoire building, or across at the University – and the first thing I learned on Day One was not to show my face in the Library on a research day! If you’re seen, you’re naturally enough assumed to be available. And cries of “while you’re here …”, just cause embarrassment all round. Best not to be there, until Wardrobe run me up a cloak of invisibility. I wasn’t intending to open library-related emails on research days, and an out-of-office message alerts my unavailability, though I’ve realised it keeps things flowing more smoothly if I open anything that looks as though it can be answered quickly. After all, I can always forward it to my mini-me. So – does having a PhD make a difference? We had our first project team plenary meeting last week. I almost had to pinch myself! I might not have ascended to the dizzy heights of a promotion, but considering all that I’ve done post-doctorally, having a PhD has certainly made a difference. I’ve even been asked to talk to postgraduates about career trajectories, and that’s something I never imagined myself doing! But I’d have to qualify my response to the question. Complacency gets you nowhere – it takes determination to capitalise on the potential benefits. But if you can pick up the ball and run with it – that gives you the best chance of benefiting from your hard-earned qualification.